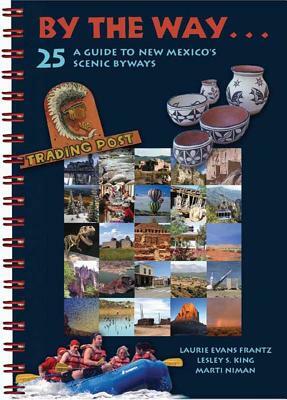 This handy and appealing book provides the most up-to-date guide for those who want to explore New Mexico's officially designated Scenic Byways and their off-the-beaten-track destinations. Packed with helpful driving directions and useful tidbits, By the Way will also be cherished by armchair travelers who want to learn more about the Land of Enchantment. Each chapter includes a detailed narrative itinerary of one of the twenty-five byways, illustrated with colorful photos and a regional map. Lesley S. King adds evocative essays and photos of roadside attractions along each route. Designed to fit in a glove compartment, the spiral- bound book also features a handy fold-out state map in a back pocket. It makes an ideal gift for people who love to travel New Mexico's back roads. Laurie Evans Frantz is a writer and the New Mexico state scenic byways coordinator at the New Mexico Tourism Department. Marti Niman, writer and photographer, serves as the assistant marketing manager for the New Mexico Department of Energy, Minerals, and Natural Resources.